Finding the right streaming solution for your school sports team shouldn’t be hard. This is why Stream Dudes created equipment packages, specifically designed with education and school sports markets in mind. Streaming your school’s events is a great way to connect with parents and the surrounding community at large. Our team is experienced in working with school districts in various sizes in to providing well-priced solutions, that deliver professional results. Base Hit: Start small and grow your audience big! The Switchblade Flyk is small in size, big in features, and brings all of the power of vMix to any broadcast. Our Base Hit kit was designed to be portable, functional, and simple enough for a single-person setup or operation. The included upgrade to vMix 4K combined with a pair of PTZ cameras, the Base Hit can be used to cover any event in any place. Triple Play: We understand that budgets are tight and that having workflow flexibility is key. The Triple Play combines everything you need to have a successful broadcast from the sidelines, from the auditorium, or even in the studio. 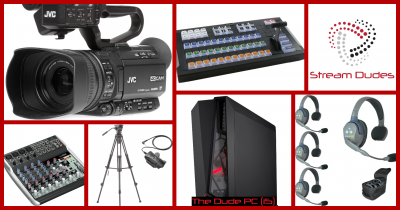 Built around our 6-Core powered Dude PC, there is plenty of power to stream, record, and chroma key for thousands less than the “big name” all-in-one streaming boxes. 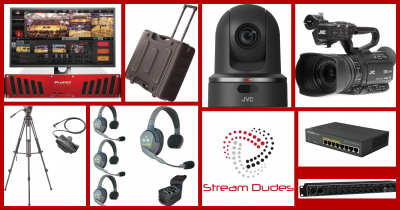 Add in the sharp optics of the JVC GY-HM180 Cameras and a 4-Person wireless intercom kit, and the Triple Play is ready to make any production an all-star. Home Run: Don’t just stream your games or events- produce them with power and ease with the Home Run bundle. The JVC ProHD Studio 4000S brings the industry’s easiest instant replay, touchscreen operation, CCU functions and much more in a single box. With JVC’s advanced IP functionality, both of the included JVC GY-HM250 and the KY-PZ100 PTZ Cameras, are easily controlled directly from the ProHD Studio. 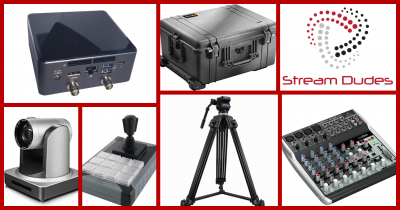 Professional broadcasting has never been this easy or affordable. Grand Slam: Get your team the attention they deserve at home or on the road. 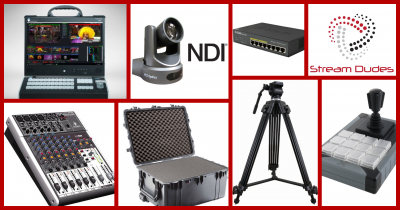 Our Grand Slam package combines the power of the Production Bot Switch 8 and the flexibility of NDI technology to give you a single cable solution for the included PTZOptics Cameras with NDI. The Grand Slam gives you unmatched portability, along with the convenience of being able to control the whole production with a minimal crew. We understand the importance of helping educators teach students how to effectively produce a broadcast, which is why we offer lesson planning and curriculum planning services upon request. Contact Us for a personalized quote and equipment consultation.